If you have been visiting dieselstation from quite a while, we believe you might be well aware about the changes BMW and Mercedes keep bringing to their lineups but Audi isn’t one from the herd and they proved this again with their latest release Audi S8 2015. Portraying luxurious exterior that beehives a super-comfortable interior and rolling over thunderous V8, this new release is undoubtedly a lap ahead of others in its segment. 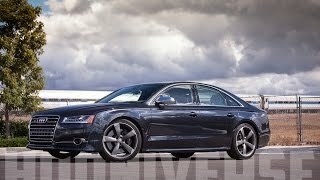 Let us have a look at the review of Audi S8 2015 to know more about it. We didn’t notice much changes in the interior of Audi S8 2015, however those that came across our vision includes new inlays and colors, wood trim and upholstery. Being loyal, we firmly believe that if something is good, there isn’t any harm in carrying it over. After all we are talking about the technology and standards that which even Mercedes hadn't thought of presenting. However the entire getup isn’t new, the interior of Audi S8 2015 comes with black/Vermont brown design as addition being accompanied by Carbon twill copper inlays over door panels. In all though we found the interior matching its predecessors but with its subtle changes, this new release s indeed a impeccable definition of luxury and comfort. Just like interior, the exterior of Audi S8 2015 as well receives few changes. There’s a reason behind calling it ‘few’ and that’s you might not notice these changes at first glance. However with the 2014 and 2015 model standing together you can easily notice. Starting with the front fascia of Audi S8 you’ll notice the singleframe trademark grill designed with more angular look, especially the top corners. The set up sit amidst redesigned headlights, which now have lost the waveform design and looks extremely gorgeous with their new look. Side apron gets more defined chin while the air intakes take a larger look and sit aggressively over the front apron. Moving towards the rear end of Audi S8 2015 the first thing to come across your eyes is the wide trunk lid allowing you easier access over loading and unloading the cargo. Beside it the taillights get more aggressive through flatter design. The entire setup gets adored with the chrome strip over the center of trunk lid, making the exterior of Audi S8 2015 look a lap ahead of its predecessor. Beneath the hood of Audi S8 2015 sits a 4.0 Liter TFSI turbocharged V8 engine generating total output of 520 hp and peak torque of 652 nm paired to eight-speed automatic transmission. 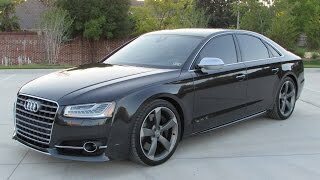 With this power throbbing its wheels, the top speed of Audi S8 2015 touches mark of 155 mph (electronically limited) while can knock the 0-62 mph sprint in 4.2 seconds.